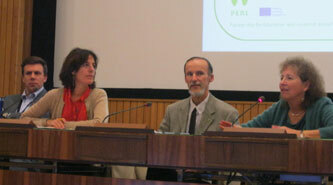 The 19th Annual Conference of the International Environment Forum was held in association with the international conference of the Partnership for Education and Research about Responsible Living (PERL) at UNESCO headquarters in Paris, France, on 10-11 March 2015. IEF is a partner in PERL. The theme of the PERL International Conference was "A Decade of Responsible Living: Preparing, Engaging, Responding and Learning". The IEF organized a special symposium on ethical transformation and education for service, and IEF members were also co-authors on a research paper about values-based indicators in education and the toolkits that IEF has contributed to developing. 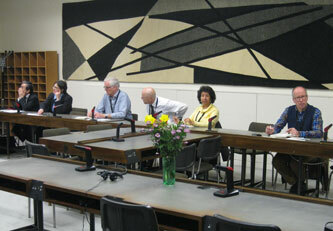 The IEF General Assembly was held at UNESCO Headquarters just after the end of the conference. 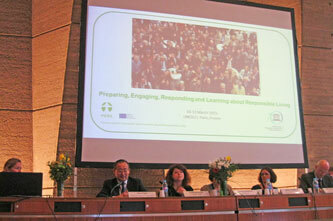 About 120 participants from across Europe and around the world gathered at UNESCO Headquarters in Paris, France, for the 10th International Conference organized by the Partnership for Education and research about Responsible Living (PERL), which is directed by IEF board member Victoria W. Thoresen of Hedmark University College, Norway. 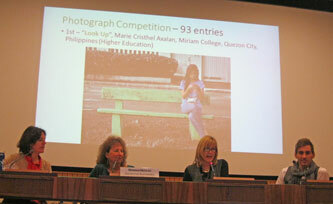 The conference was opened on 10 March by the Assistant Director-General of UNESCO, representatives of UNEP, the European Commission, Hedmark University College, the Norwegian and Swedish Ministries, and a youth representative. There were a number of distinguished guest speakers, research presentations in parallel sessions, workshops, the IEF Symposium, and an International Roundtable. The full list of research presentations and abstracts can be downloaded at https://eng.hihm.no/project-sites/living-responsibly/conference-paris-2…. Nourishment for the spirit was provided at several points throughout the conference by the multi-talented IEF member Ismael Velasco who enchanted the spirits and touched the hearts of everyone with his mime and story-telling skills. The first keynote on "From Cosmetic Reform to a Whole System Transformation" was given by Arjen Wals, University of Wageningen, the Netherlands. He contrasted the push to consume, the manufacturing of doubt over climate change, and the erosion of trust in science in our present society, with the co-creation of sustainability and meaning. We need to go from transmissive learning to learning that is transdisciplinary, transboundary, transformative and transgressive (questioning the dominant paradigm). For Wals, sustain"ability" should include the dynamics of sustainable development (sustainability literacy, systems thinking and adopting an integral and dynamic view); a critical dimension questioning hegemony and routines, analyzing normativity and considering ethics; a dimension of change and innovation (leadership and entrepreneurship, unlocking creativity, utilizing diversity, appreciating chaos and complexity, and empowerment and collective change); and an existential dimension connecting with people, places and other species, with passion, values and making meaning. To facilitate this, we need a curriculum with new content, research including practitioners and citizen science, connecting with the multiple stakeholders in society, schools and institutions that walk the talk, and a pedagogy based on systems thinking, social learning, integrative design, discovery, values and ethics. A second keynote was on "Positive Deviance: A Flipped Approach to Solving Problems" by Arvind Singhal of the University of Texas and Hedmark University College. He described the positive deviance approach to social change, using mental flips to solve complex problems. Rather that focusing on the negative, the problems, the gaps, what is not working, we should look at what is working, and what we are for. The premise is that solutions to problems do exist, and stare us in the face, but we do not see them because we do not know where to look. Wisdom is widely distributed. He cited an example of child malnutrition in Vietnam, where a study of the few outliers, poor children who were healthy, uncovered a series of simple solutions without extra resources. Since added economic value is not improving lives, we need education beyond personal growth as a commodity, more responsible and meaningful, combining learning and feeling, based on trust (including in young people, schools and teachers), co-creating in the common interest based on a joint vision and values. Research presentations were given throughout the conference in parallel tracks on Advancing policy, Transforming learning and training environments, Building capacities of educators and trainers, Empowering and mobilizing youth, and Accelerating sustainable solutions at the local level. The research paper in which IEF was involved concerned the toolkits for values-based education prepared under the supervision of the PERL Workgroup led by Arthur Dahl, in collaboration with the research team at the University of Brighton behind the values-based indicators project (http://www.esdinds.eu). 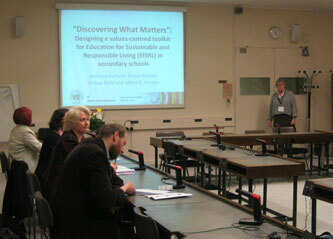 Entitled "Discovering What Matters": Designing a values-centred toolkit for Education for Sustainable and Responsible Living (EfSRL) in secondary schools, the presentation by Gemma Burford (University of Brighton), on behalf of co-authors Elona Hoover, Arthur Dahl and Marie K. Harder, showed that disseminating knowledge about sustainability issues is rarely enough, in itself, to motivate long-term behaviour change. Focusing on global problems such as climate change, biodiversity loss and poverty often serves to increase people's sense of despair and helplessness, and may result in apathy rather than positive action. An alternative approach, however, is to help people to reflect on what is important to them in life - their core values - and to envision the type of future that they want on the basis of those values. This approach has already been found useful for closing "value-action gaps" in organisations promoting non-formal education for sustainability. She described the collaborative research project with civil society organisations, funded by the EU FP7 programme, which constituted the starting point for PERL Workgroup 1. 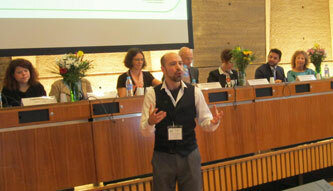 The Workgroup and affiliates developed values-centred toolkits for secondary schools. Different qualitative sources were used to explore the values underpinning Education for Sustainable and Responsible Living, and how they might be enacted in schools. These insights were translated into a set of engaging, participatory and fun activities - the "Discovering What Matters" toolkit. She related some experiences of capacity-building with prototypes of the toolkit in different schools, and shared a vision for the future. The Tuesday afternoon programme started with the International Environment Forum Symposium on "Ethical Transformation and Education for Service at the Community and Institutional Levels". 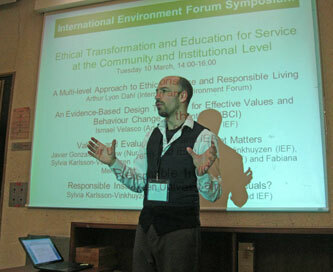 In the first paper on "A Multi-level Approach to Ethics, Service and Responsible Living", Arthur Lyon Dahl (International Environment Forum) presented a systems perspective, showing that responsible and sustainable living cannot be achieved by each of us acting alone. Individuals are part of communities that can either reinforce or impede sustainable actions. Learning the pleasure that comes from serving others in the community can provide positive reinforcement and build hope in the future. Just as an ethical approach can motivate individuals to live more responsibly and devote their lives to service to society, so it is important to unite communities around a shared vision of ethical sustainability values. He noted that many of today's sustainability challenges come from the irresponsible behavior of governments, businesses and other institutions, that are failing to provide a values-base for sustainable lifestyles. While governments are supposed to serve their citizens and often adopt lofty goals, the lack of ethical principles can easily lead them in other more self-serving directions. Businesses also consider too often that their ends of growth and profitability justify any means; if they are to contribute to a sustainable society and become socially and environmentally responsible, they also need to incorporate ethical principles and service to society into their institutional framework. If there is coherence between ethics and values at the individual, community and institutional levels, action at all these levels can become mutually reinforcing. See the full paper. The second paper by Javier Gonzales Iwanciw (Nur University and IEF), Onno Vinkhuyzen (IEF), Sylvia Karlsson-Vinkhuyzen (Wageningen University and IEF) and Fabiana Mendez Raya (Nur University and IEF) on "Valuing and Evaluating Leadership that Matters" was presented by Onno Vinkhuyzen. He noted that transforming society towards sustainable consumption and production requires more from leadership than what current leadership models provide due to the complexity of the enterprise and the value dimensions involved. 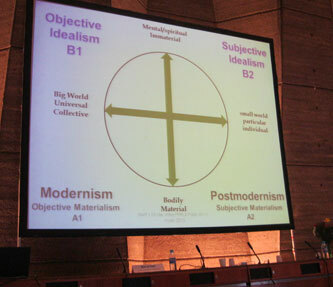 Concepts and frameworks such as complexity, collaborative, ecological, and sustainability leadership have been proposed at the level of theory. In parallel many institutions provide leadership training aiming to both motivate and enable students to become leaders for sustainability. Many of them are however not sufficiently comprehensive and often do not cover the "inner" value dimensions essential to generate the necessary vision, understanding and motivation, or they lack tools to evaluate the impact on the value dimensions. The team seeks to bridge this gap by adapting the indicator framework developed within the We Value project (University of Brighton) to fit the training in the Moral Leadership Framework developed at Nur University in Bolivia. This leadership model has the potential to support individual and collective transformational change amongst others because it addresses the value dimensions comprehensively. The We Value indicators were adapted and expanded, and a pilot test of the indicators launched with students (midcareer professionals) who receive 80 (semester hours) training in moral leadership at Nur University, some before training, some just after, and a third group much later. The third presentation on "An Evidence-Based Design Template for Effective Values and Behaviour Change Interventions" described the latest research by Ismael Velasco (Adora Foundation and IEF). In the context of the Millennium Development Goals, UNESCO identified the "knowledge-action gap" as a key challenge, where understanding what needs to be done is not followed by concomitant action. Education for Sustainable Development (ESD), as defined by the United Nations, aims to "encourage changes in behavior that will create a more sustainable future in terms of environmental integrity, economic viability, and a just society for present and future generations." Yet even after 20 years, evidence-based interventions that measurably achieve this are rare. How do we change hearts? Velasco presented the key design elements which, incorporated into a purposive educational intervention, can generate positive and sustained values and behavioural change. He proposed a generic design template that others can apply for successful Behaviour Change Interventions, with moderating human and institutional factors. This template has been "reverse engineered" from a research-established example of "best practice" in the International Federation of the Red Cross programme "Youth as Agents of Behavioural Change", delivering demonstrable values and behaviour change in a significant number and proportion of participants, replicated across over 100 countries and diverse social and institutional contexts, using non-cognitive methods. Responsible Institutions - Responsible Individuals? 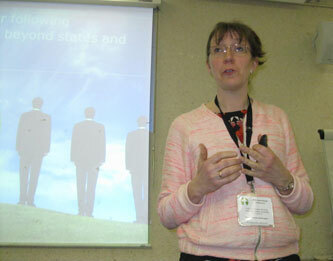 In the last presentation on "Responsible Institutions - Responsible Individuals? 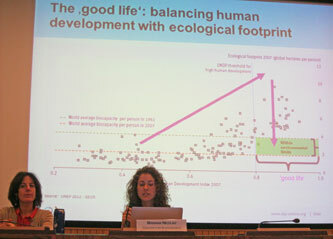 ", Sylvia Karlsson-Vinkhuyzen (Wageningen University and IEF) referred to the importance of personal choice and commitment for responsible living in order to transform societies towards more just and sustainable ones. It is undeniable that unless individuals bring those responsible choices with them into their institutional setting, the possibilities for individuals to live responsibly will be severely constrained; the physical, social and educational infrastructure required will not be created. The paper focused on the role of institutions in enabling responsible living by proposing the way institutions relate to international norms. The international community of states has a good track record of agreeing on setting goals for what a "Future We Want" should be like and formulating obligations, albeit often vague, for what states should do to contribute to such a future. Currently only states are formally obliged to comply with international law in its different forms. In a situation when states do not take their responsibility for achieving these visions sufficiently seriously and when states are not able to achieve them without serious commitment from other institutional actors and individual citizens, it is time to reconsider what responsibility institutions beyond states have towards international norms, including in the domain of sustainability and justice. The paper first outlined the rationale for non-state institutional actors to take on responsibility towards implementing international norms. 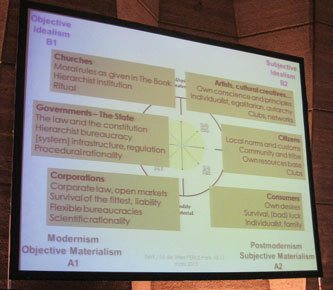 It then reviewed relevant normative theories for allocating responsibility in a governance system. Thirdly, it identified some practical strategies for how to facilitate such responsibility. Based on the culpability principle, the capacity principle and the concern principle, individual accountability and ethical responsibility can be facilitated by external accountability. 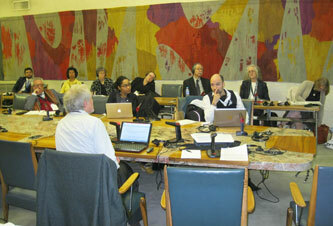 A parallel workshop on "Global Frameworks for the Transition to Sustainable Lifestyles" moderated by Jan Vandemoortele discussed the The Global Action Plan for ESD, the 10-Year Framework of Programmes for Sustainable Lifestyles and Education (http://www.unep.org/10yfp/Portals/50150/downloads/10YFP-SLE_DraftConcep…), and the Sustainable Development Goals. • Consumers with their own desires, individualist, family-centred, with survival and (bad) luck as important. • Corporations, based on corporate law and open markets, survival of the fittest, liability, flexible bureaucracies and scientific rationality. He called for an integrative worldview that avoids extremism and the blocking of other worldviews, a middle ground of pluralism and diversity, with alliances of business and consumers, churches and governments. He referred to the 1972 study for the Club of Rome, "The Limits to Growth" and the lack of social dynamics to listen to the warnings. The predicted collapse may happen if vested interests continue to block progress and the extreme predictions of climate change and biodiversity loss are right. But all the seeds of change are also there. The financial system is extremely short-term and vulnerable, but the situation is too political and conflictual to face these realities. 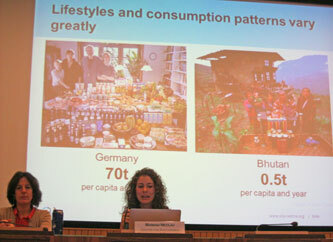 The second day of the conference opened with Mariana Nicolau of the UNEP/Wuppertal Center for Sustainable Consumption and Production, speaking on "Actor leverage points for engaging and empowering sustainable lifestyles". She described many initiatives, from the SPREAD Sustainable Lifestyles 2050 project (http://www.sustainable-lifestyles.eu/) which ended in 2012, to the Global Network on Sustainable Innovation and Entrepreneurship (http://scaling-up.net/), and the World Business Council for Sustainable Development's Action 2020 (http://www.wbcsd.org/action2020.aspx and http://action2020.org/) to a recent European Environment Agency report on innovative business models for sustainable lifestyles (http://scp.eionet.europa.eu/ETC_InnovativeBusinessModelsforSustainableL…). There are civil society leverage points that provide access to information on local innovations, promote social inclusion and raise awareness. We need to develop multistakeholder engagement, with actors supporting each other to rethink our models, develop collaborative consumption and build a circular economy. 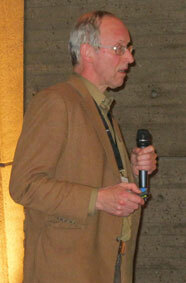 The winners of the PERL medial competition were announced. This was followed by an International Roundtable on "Responsible Living around the Globe" with Victoria Thoresen (Europe), Sue McGregor (Canada); Luis Flores Mimica (Latin America), Robert Didham (Asia), and Carme Martinez Roca (Africa), moderated by Bernard Combes of UNESCO. Most felt that little real progress had been made towards education for responsible living around the globe. There were many good practices, but they were still going against the tide. Universities were very traditional, with disciplines in silos and narrow requirements for research publications. This works against action-based research, participatory learning and community-based projects. Educational change takes 40 years. In the discussion, it was pointed out that traditional researchers are stuck in an old scientific paradigm that is no longer working. 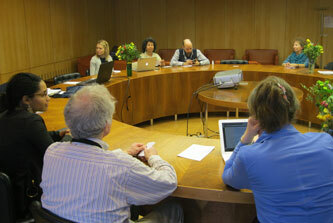 There is mobilization around networks, but a vacuum between networks, so a network of networks is needed. 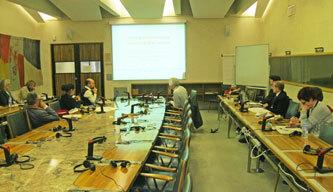 There was a need for methods to evaluate sustainability changes in a multidisciplinary way. The values-based indicators project (http://www.esdinds.eu) was a start, and had shown that the alignment of academics and civil society organizations was possible. 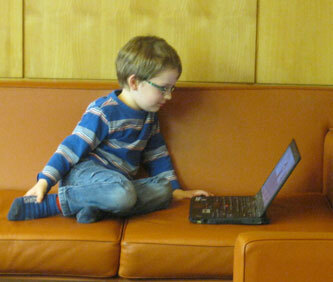 It is important to reach beyond academic networking to tackling real issues. In the USA, NGOs are funded to find local solutions to local issues like renewable energy and changing diets. The panel agreed that a huge paradigm shift in ways of thinking was needed, from university entrance examinations to teacher training in active learning to new learning environments in schools. The boundaries between formal and informal education for sustainable lifestyles should be eliminated. We should bring life into the classroom, and take the classroom to life. Traditional knowledge needed to be documented, used and shared in the classroom. Ethics should be brought into the classroom, empowering students and showing their value. Responsible living is not something new, but something many people already do. We need to go beyond the gap between aspirations (models) and reality. When people know and care for each other, their behaviour is completely different. Victoria Thoresen concluded the roundtable by referring the recent draft "Pathways to Sustainable Lifestyles: Global Stocktaking Report" prepared by PERL for UNEP under the 10-year Framework Programme for Sustainable Consumption and Production (10YFP), which provides a global and regional analysis of barriers and trends and showcases good practices (http://www.scpclearinghouse.org/upload/publication_and_tool/file/408.pdf). We see a two-fold process in the world, both a collapse and a new world emerging. We need understanding and dialogue among all the actors in their diversity, coming together to build empathy and to learn from each other. 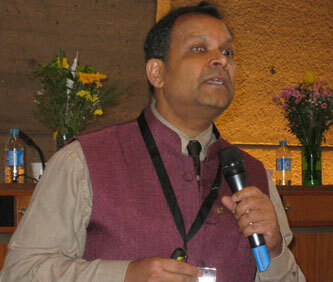 "Positive Deviance" by Arvind Singhal, University of Texas/Hedmark University College, following up his earlier keynote. 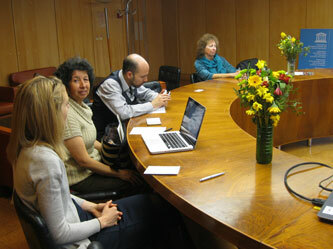 Among the Research presentations on Wednesday, a couple were of particular interest. Marilyn Mehlmann described the work of Global Action Plan International (http://www.globalactionplan.com/) in "Learning for Sustainability: A Systemic Approach to Behaviour and Beliefs" with a methodology of learning for change through action and awareness, with constant experimentation and learning from experience. 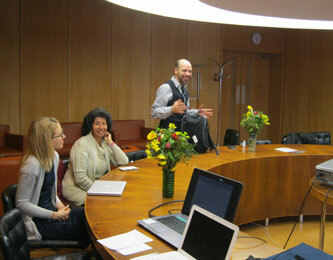 IEF member Ismael Velasco of the Adora Foundation discussed technology and social action, based on field work in Bristol (UK), Greenland and Tanzania, involving a vision of where the world is going, connection and action. He also described a recent cloud conference for PERL, with story-based priming of crisis and solution to stimulate emotion, arts-based self-expression to build an emotional identity, and a choice of actions with sharing. This goes beyond a passive webinar to make the participants agents for change. 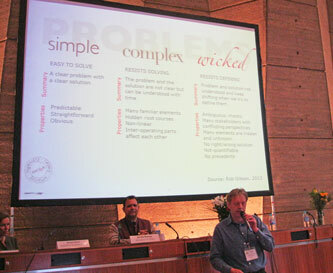 In the closing plenary, the conference approved a set of recommendations to continue the network of collaboration which the Consumer Citizenship Network and then PERL have built so successfully over the last 10 years, once the funding from the European Union for the PERL Erasmus Network ends late in 2015. In her closing remarks, Victoria Thoresen, who created and has led the network since its beginning, said she was a doer and dreamer, with a vision of a world of peace without war, without prejudice, where people are not dying of poverty while others have extreme wealth. She had walked with Martin Luther King, and had tried to build a world where we can share more, and cry on each others' shoulders. She has been called utopian and naïve, but she feels empathy for the child soldier, the abused woman, and Mother Teresa's lepers. 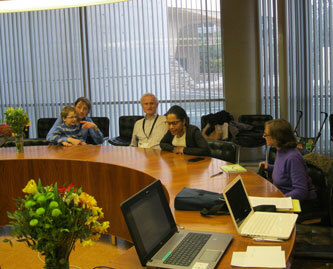 The work of PERL has been timely, as we have been learning and sharing, and building bridges. Sustainability is changing, and the world is changing, so we should go with the flow. We have developed a vocabulary of caring, of integrity, empathy and moderation, values that we do not often see on television. 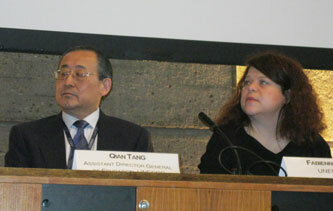 We have not done enough about justice, although equity and distribution have been discussed in the conference. We need to reach deeply into our principles and values, curious for new solutions and new knowledge, and share the fruits of our knowledge with everyone. 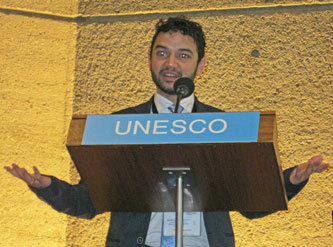 The International Environment Forum held its 19th General Assembly at UNESCO immediately after the close of the PERL Conference. 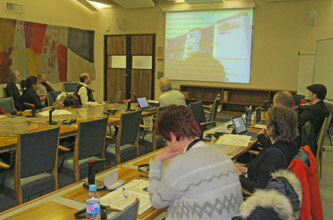 The members present reviewed and consulted on the IEF Annual Report. 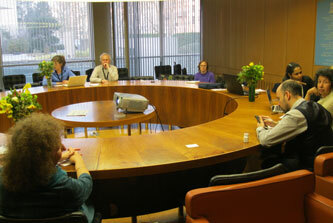 They participated in the election of the IEF Governing Board along with members voting by email. 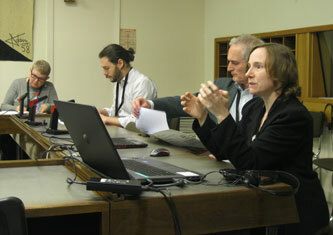 They also consulted on plans for the coming year. 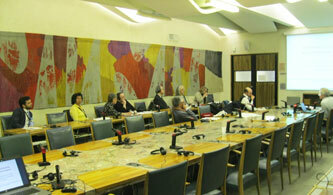 See the full report of the General Assembly. A first step to extend and perennialize PERL is the establishment of the UNESCO Chair in Sustainable Lifestyles at Hedmark University College, occupied by Victoria Thoresen, with an accompanying Education for Sustainable Lifestyles UNITWIN network of 30 partners including the International Environment Forum. 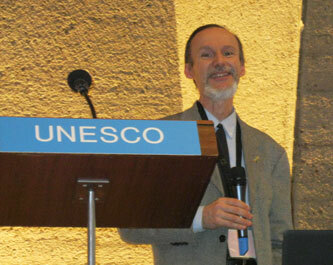 The UNITWIN network held its inaugural meeting at UNESCO on 12 March, the day after the PERL Conference, with Arthur Dahl representing IEF. This UNITWIN partnership is a citizen-centred, evidence-based, policy-informed, action-oriented network of research and education connecting communities to catalyze responsible and sustainable lifestyles. It will contribute to the Global Action Programme of UNESCO which follows on from the Decade of Education for Sustainable Development (2005-2014). One specific commitment already registered is for Hedmark University College and the International Environment Forum to continue the work on values-based indicators. Other potential activities include research on the barriers to implementation of education for responsible living and what works, development of climate change education, more translation of materials into video and images, on-line education through massive open online courses (MOOCs) and cloud conferences, and methods for evaluating the changes we intend through education. 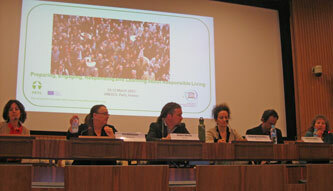 The UNITWIN programme will also contribute to the launching of the Sustainable Lifestyles and Education Programme component of the 10-year Framework of Programmes on Sustainable Consumption and Production approved at Rio+20, and will be looking ahead to education for the implementation of the Sustainable Development Goals. The present UNITWIN partners are: University of Agder (Norway), Lund University (Sweden), Uppsala University (Sweden), Aarhus University (Denmark), University of Helsinki (Finland), Technical University of Berlin (Germany), Lithuanian University of Educational Sciences, Carlow Institute of Technology (Ireland), VIVES University College (Belgium), University of Malta, Setubal College of Education (Portugal), Society for Life-skill Teachers in Upper Secondary Schools (Iceland), Consumer Protection Board of Estonia, Milano Politechnical (Italy), Rhodes University (South Africa), Rural Federal University of Rio de Janeiro (Brazil), Beijing Normal University (China), City of Dublin Education and Training Board Curriculum Development Unit (Ireland), University of Ljubljana (Slovenia), Consumers International Africa (South Africa), Consumers International Latin America and the Caribbean (Chile), Consumers International (UK), International Foundation for Interdisciplinary Health Promotion (South Africa), Institution for Global Environmental Strategies (Japan), French Institute for Consumer Affairs (France), Strategic Design Scenarios (Belgium), Free Consumers Association (Netherlands), International Environment Forum (Switzerland), University of Namibia, and Hedmark University College (Norway). IEF members interested in becoming involved in the activities of the UNITWIN network should contact the IEF secretariat. 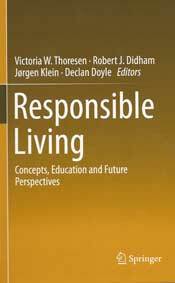 • Robert J. Didham, Declan Doyle, Jorgen Klein and Victoria W. Thoresen, Responsible Living: Concepts, Education and Future Perspectives, pp 3-12. • Victoria W. Thoresen, The Route to Responsible Living: Doubting, Discovering, Daring and Doing, pp. 13-23. • Arthur Lyon Dahl, Ethics in Sustainability Education, pp. 27-40. • Gemma Burford, Elona Hoover, Arthur Dahl and Marie K. Harder, Making the Invisible Visible: Designing Values-Based Indicators and Tools for Identifying and Closing 'Value-Action Gaps', pp. 113-133. • Siri Wieberg Klausen, Reflections on a Dedicated Partnership: An Interview with Victoria W. Thoresen, pp. 275-283.